Several of you have contacted us asking "what is going on in Colombia" or "I don't understand". Many of you have heard that outcomes of the vote yesterday (Sunday, October 2). Last Monday (September 26), Curtis attended the signing of the Peace Agreement (he wrote about it in last week's blog). Last Monday the President of Colombia and the leader of the FARC signed the final Peace Accords, which they have been negotiating for the last 4 years. It was a historic moment for Colombia, it was the first time in more than 50 years the country had peace at their fingertips. 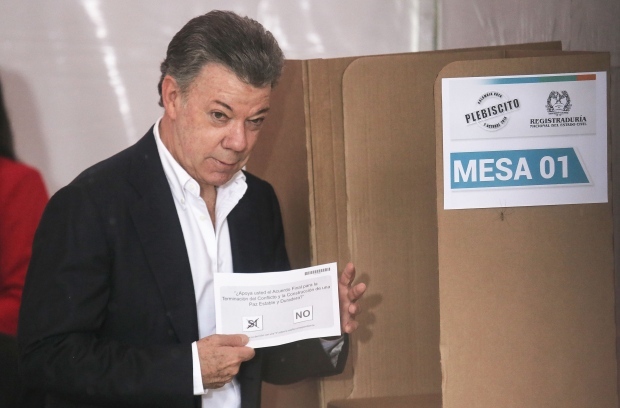 It just needed one more step to be final, the Colombian people needed to vote to have it ratified. That vote was yesterday. The ballot was simple, "yes" or "no": do you support the final peace accord. In the week leading up to the election there was a lot of excitement, and yes was favored to win. However, when the polls closed at 4:00 pm, it was too close to call. By 5:15 they had declared that the "no" vote won. It was close, yes 49.7% and no at 50.3%, with a mere 38% of the country voting. We are in shock, there was not a plan B, the plan was peace. The president addressed the people last night and declared the bilateral ceasefire will continue (good) and he will continue to work for peace and an agreement that the Colombian people can accept (also good). The FARC have also promised that they will not go back to arms, but continue to use words (also good). These are all positive promises in the midst of what feels like failure. However, today I am also reminded of how proud I am to be a Lutheran. The Lutheran church here has spoken and acted in favor of this peace process. I was traveling over the weekend, so Curtis and I didn't worship together on Sunday, but we both heard the same message in the different churches: we are called to work for peace, we are called to forgive, to work for justice, and follow the teachings of Jesus. "We are called to act for justice, we are called to love tenderly, we are called to serve one another; to walk humbly with God" (Refrain from the Hymn #720, We Are Called). Please continue to keep Colombia's peace in your prayers as the next steps forward are still unknown. To read more about what is happening in Colombia, this is a great article from Washington Office on Latin America and Insight Crime.